We heard the rumor for quite some times that Android powered camera is coming to the market. And Nikon is the first one to unveil their Android based Coolpix camera to the press. 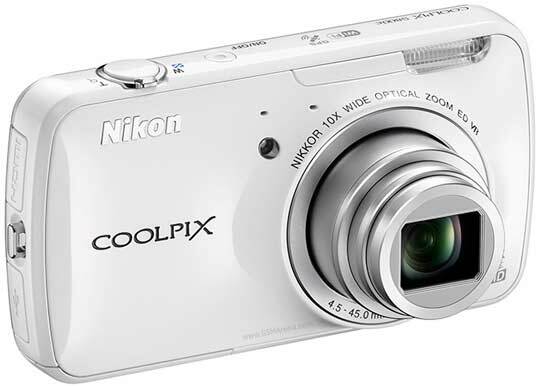 Nikon Coolpix S800c comes with a 16 megapixel BSI CMOS sensor, 10x optical zoom, 1080p video recording with stereo sound, 3.5-inch OLED touchscreen, EXPEED C2 processor, GPS and Wi-Fi. Android 2.3 Gingerbread is used as its operating system. Nikon follows a very interesting way to handle Android on their camera. The S800c has two modes in the software. One is the camera mode and the other is the Android mode. In camera mode S800c works like any other Nikon camera with a touchscreen. And in the Android mode it’s like a mini Android smartphone, complete with all your favorite apps from the Play Store. Of course there is no cellular connectivity, so you will have to use the built-in Wi-Fi to connect to the Internet but other than that it would pretty much behave like your average Android device. The S800c also has a feature where you can wirelessly transfer images from the camera to another Android device. You will have to install an app from Nikon on the other Android device and then it syncs with your S800c over Wi-Fi and lets you transfer images. Those images then become accessible through the photo gallery on the other Android device. The main advantages of having Android on your camera is that you can now share your pictures that you take on the camera even before you connect it to a computer. Just use one of the many apps available on the Play Store and upload it to a social network of your choice. You could even add some photo effects using the image editing applications. The Nikon S800c will be available in September 2012 in black and white. Price of this exciting gadget will be around $349.95. Check out their official website and read the PR to know more about Nikon Coolpix S800c. TOKYO - Nikon Corporation is pleased to announce the release of three new COOLPIX S-series models that incorporate advanced functions in a stylish design. They are the S6400, S800c and S01. The S800c establishes a new line in the COOLPIX S series powered by Android with built-in Wi-Fi® compatibility for operation similar to that of a smartphone and wireless Internet connection. With its backside illumination CMOS sensor with an effective pixel count of 16.0-million pixels and 10x optical zoom NIKKOR lens, however, the S800c enables capture of sharp, blur-free and beautiful images that can be extremely difficult to capture with smartphones. What's more, users can take full advantage of the camera's other features, including support for recording of full-HD movies, to upload their stunning photos and movies to social networking sites. The S800c fulfills Nikon's latest proposal for new ways to use digital cameras–Capture, View, Connect, Enjoy–all in a single, compact body. In addition to superior basic camera performance, the S800c offers the natural operation and communications functions of a smartphone (except the phone function), making it a single product for shooting, viewing, connecting, and enjoying. Nikon proposes new ways of enjoying digital photography with the S800c and the fun it offers with network connections. Setup and text input for Internet connection using operations that are similar to those used by Android smartphones is possible. The beautiful still photos and movies recorded with this digital camera, as well as comments, can be posted to social networking sites such as Google+™, Facebook, and Twitter*. Not only is posting to an SNS simple, but browsing them is also smooth and easy. Users can customize their cameras by downloading favorite apps from Google Play™. This will expand the ways in which users enjoy digital photography. A number of Google apps, including Google+™, YouTube™, Google Maps™, and Gmail™ come preinstalled on the camera. The camera's Upload to Smart Device app can be used to transfer high-resolution photos and movies to smart devices running the Android or iOS operating system over a wireless connection. It is often very difficult or even impossible to capture decisive moments or telephoto shots with a smartphone. The S800c, however, is always ready for those once-in-a-lifetime images with a level of performance that ensures sharp, blur-free photos. It allows users to easily express themselves in a wide variety of ways as photos with superior image quality and definition can be uploaded directly from the camera to a SNS. When the my Picturetown app on Google Play™ is downloaded and installed, images captured with the S800c can be easily uploaded to my Picturetown. In addition, the app can be used to browse uploaded images, or to post a URL to a specific my Picturetown album to Facebook or tweet them on Twitter. It can also be used to view a list of my Picturetown albums, to rearrange albums using drag-and-drop operations, or to change their layout. Since images stored on my Picturetown can be accessed directly from the camera, users can easily view or share them with others, almost as if they were carrying photo albums around with them. The high-performance GPS module incorporated into the camera can be used to record position (latitude and longitude) information with photos and movies as they are recorded. When the my Picturetown app is used, the place where these photos and movies were recorded can be displayed on Google Maps™. *A-GPS, or Assisted GPS, is a system which can increase the startup performance, or time-to-first-fix, of a GPS positioning system by using extended ephemeris (EE) data. The data file used for A-GPS can be updated by downloading the latest file from Nikon's web site. The S800c is equipped with a 3.5-inch, approximately 819k-dot widescreen, OLED touch panel monitor. The high-resolution, widescreen, VGA OLED monitor makes shooting, viewing and sharing photos more enjoyable. The OLED enables reproduction of deeper, more vivid colors with clear and beautiful blacks in night landscapes, less loss of detail in highlights (blown highlights), and greater contrast. With a broad color gamut, subjects are vividly reproduced. This broad color gamut enables high-definition display of not only images, but the user interface as well.